First off I have to say that anyone can do this. Anyone can do any of the recipes I post. I have no formal training or education in cooking. I’m just a “normal Joe” who happens to have a curiosity about food. If I can do it, so can you. All you have to do is try. The dough, last night, ready for a slow, long rise. That being said, I’m always up for a new technique in the kitchen. I’m firmly in the “nothing ventured, nothing gained” camp. After all, how big a disaster can you get up to in the kitchen – besides catching it on fire or blowing it up? Slim chance of that in making bread. Such is the case today. 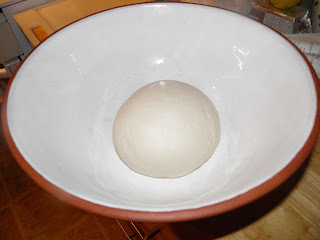 I have been reading recently about the technique of autolysis in making bread. In biology, autolysis – known as self-digestion – refers to the destruction of a cell through the action of its own enzymes. Autolysis can be used in making bread to great effect. 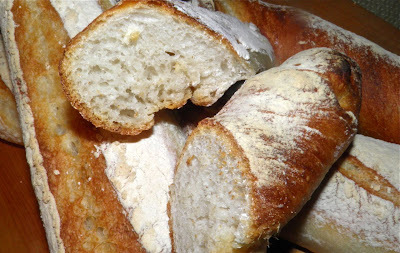 In baking bread, autolyse refers to the technique of mixing just the flour and water together and allowing it to rest. The action of the wheat enzymes allows for better absorption of water by the flour and helps the starches and gluten strands develop before the yeast is added. Usually when making loaves the yeast is proofed in warm water and added to the initial mix. Not so with this technique. In fact the yeast isn’t even proofed. It’s kneaded in with salt as granules. Scary. This is what it looked like in the morning, about triple. This takes some guts, because you have to have faith that your yeast is alive. If you’re not absolutely certain go purchase new yeast. It would be a shame to waste an overnight rise because of dead yeast. On thefreshloaf.com (go there right after you finish reading my post, it’s wonderful) someone raised an interesting point. Modern bread recipes call for kneading the heck out of bread dough, which is a turn-off for many people. But think for a minute. Mixers with dough hooks are a modern invention. Can you picture the village baker kneading a trough of dough by hand for 20 minutes or so? Of course not. Here’s where autolysis steps in. I have made few breads that I have kneaded less. Of course, I had to knead for a minute or two, three times over the space of an hour, but the result was amazing. Breads made this way are easier to form into shapes and have more volume and structure. It worked extremely well. Fresh bread with butter makes a fine breakfast! Today’s going to be a “kitchen day” for me. It’s now 7am and my baguettes have about 15 more minutes to go. After that I’m going to try a Greek inspired flaky pastry that uses the same autolyse, but no yeast. Mix flour and water in a bowl and knead briefly to bring it all together. Then let it autolyse for 30 minutes. Flatten the dough slightly, sprinkle the yeast and salt on top and “fold” it into the dough. Fold about 20 times. “Folding” means bringing the dough up over on top of itself and then pressing down. It’s akin to kneading on a board, but a little different. Repeat this process three more times at 20 minute intervals. The dough will be slightly sticky and very soft and smooth. Oil a large bowl so the bread doesn’t stick as it rises. Cover tightly with plastic wrap and a towel. Let rise overnight (at least 8 hours). In the morning (or whenever) do not deflate the dough. 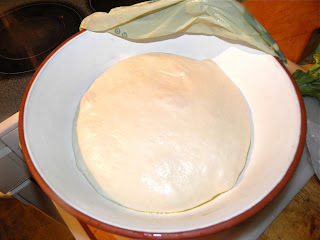 Gather the dough up and place it on a work surface. 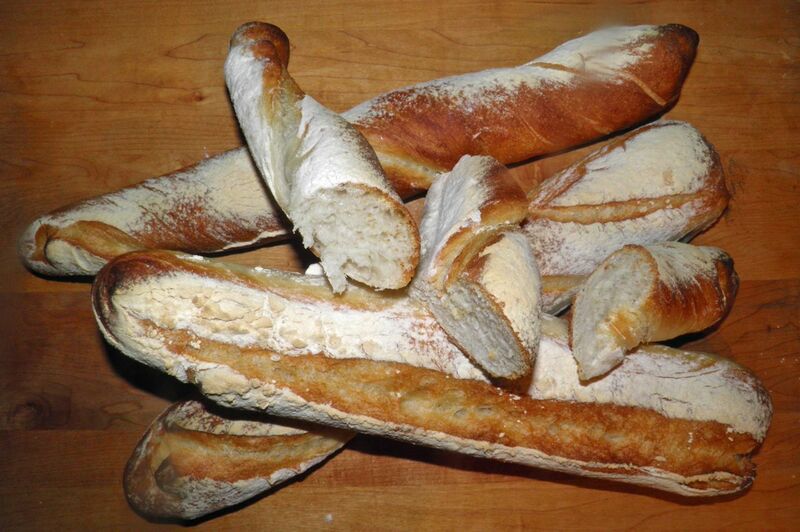 Divide into 4 equal parts and shape into about 14” baguette shapes. Cover with plastic and let rest for 1 hour. These have a nice crumb, are flavourful and a crunchy crust. Love. 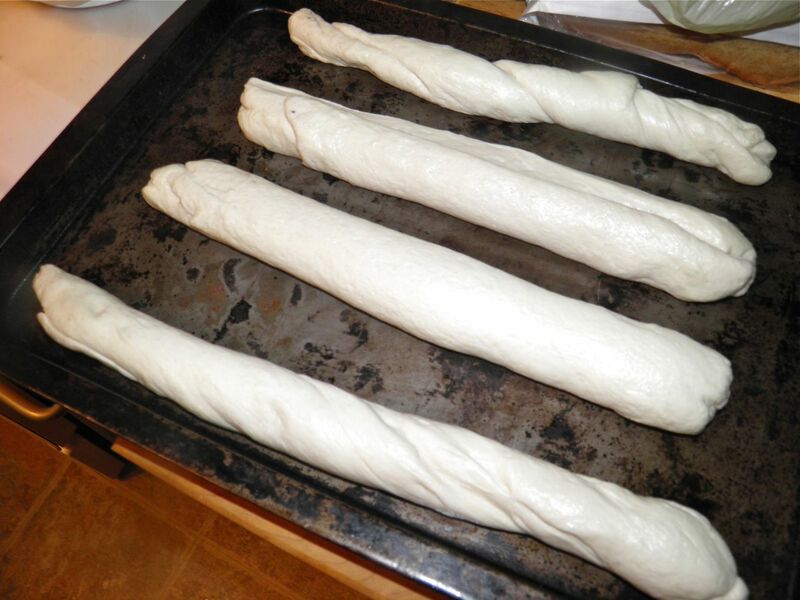 At the end of the hour, gently stretch and shape the loaves into longer baguettes. Dust well with flour. As soon as you finish shaping for the second time, turn the oven on to 475°F. Place an oven proof dish – like a cast iron frying pan – with water in it on the bottom rack as the oven heats. This hydrates the oven. After the half hour, take a very sharp knife (or a razor blade) and slice long diagonal cuts into the top of the dough. Place the bread in the oven. After 10 minutes remove the water pan and continue to bake for another 15 minutes until the loaves are brown and crusty.